Note: The temporary post “Letter from an Internet Troll” has been removed: it has resulted in some interesting information but I do not wish that person to get any further attention on this blog. 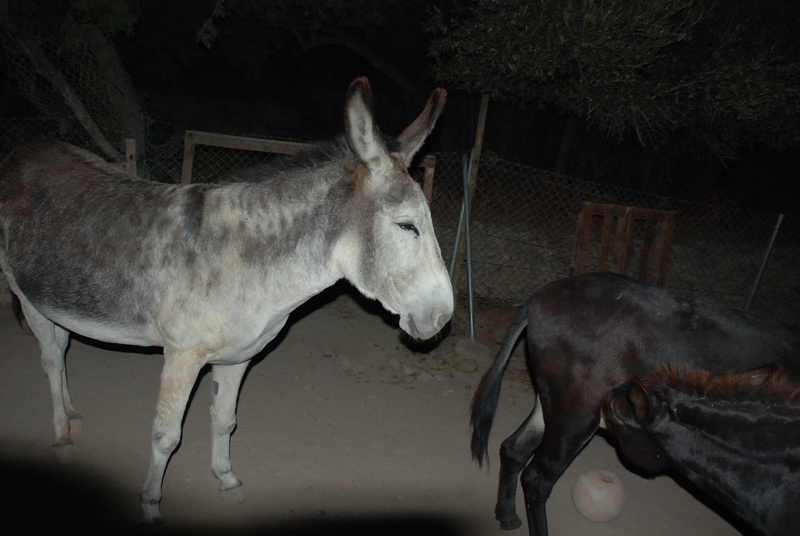 From loonies to the full moon is a nice easy step, and we return to the proper subject of this blog, which is life with donkeys. 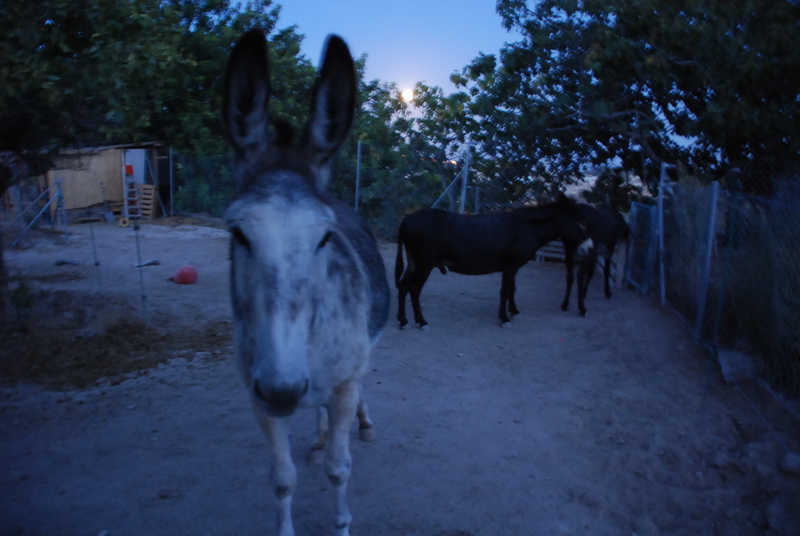 Expectation has been building up for the past few nights, and the donkeys know tonight is the full moon. 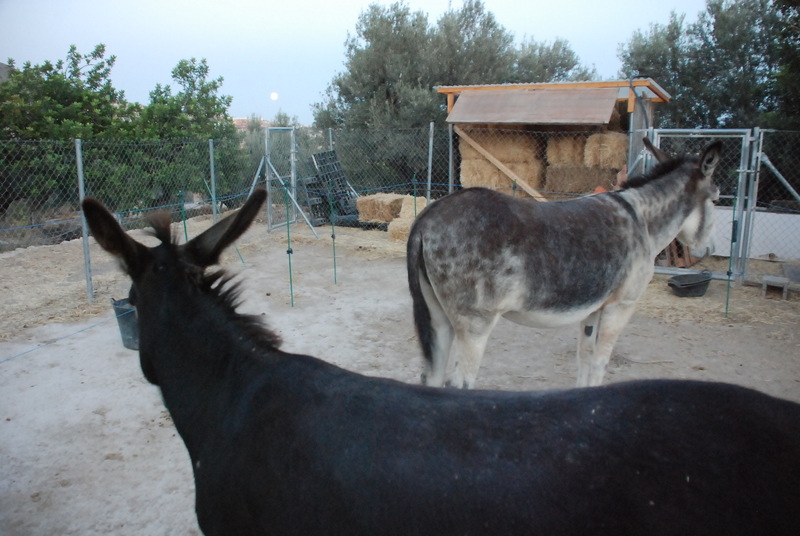 After their evening feed, and when I returned from a couple of beers in Finestrat, the donkeys were looking east. Long before the moon came up, they were already staring at the point just south of Benidorm where it would rise over the sea. They knew. They have been watching it for these past few nights. We do whimsy on the donkey blog from time to time, but this is not imagination. 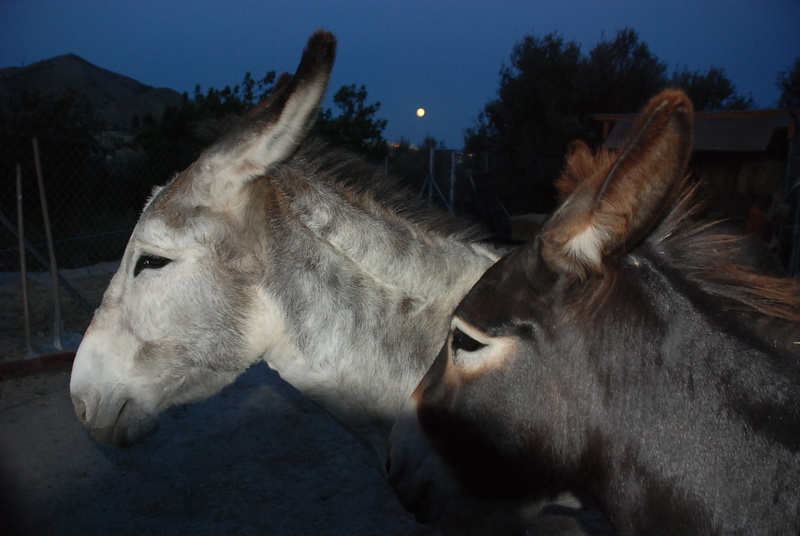 The donkeys DO know when there is a new moon. Everything indicates a change in behaviour as their excitement builds up, and more than anything there is the clear gathering of all four animals: looking, waiting, paying their vigil for the moment of the rising of the full moon.Should I blame them for their paganism? Who am I to judge? I spent much of today reading Rabbi Jonathan Sacks’ astonishing new book about religious violence, Not in God’s Name (and there will be more about that in a later post). The behaviour of groups is fascinating, and I can see the tendency to ritual here in the donkeys watching for the new moon. In exactly the same kind of behaviour that the donkeys display when food is expected, they bite each other on the hind legs, jostle and sometimes kick each other playfully. 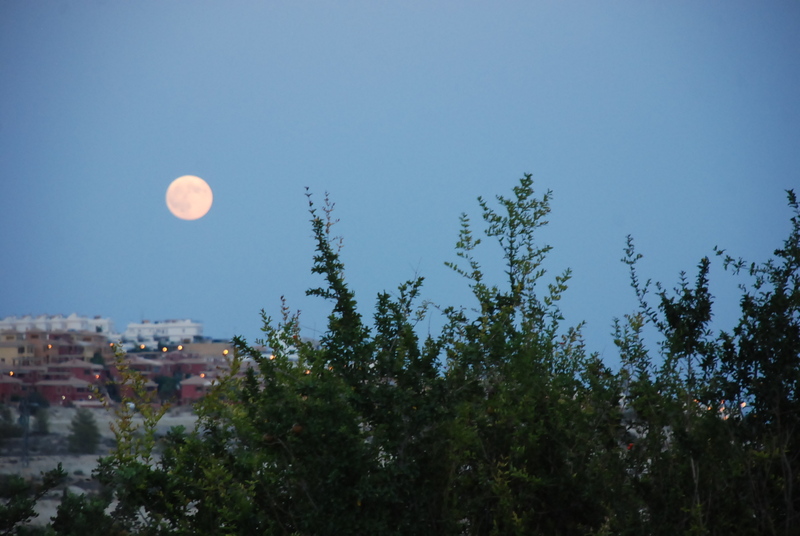 This time the focus is not the mixing of the evening feed and filling of mangers, but the rising moon. 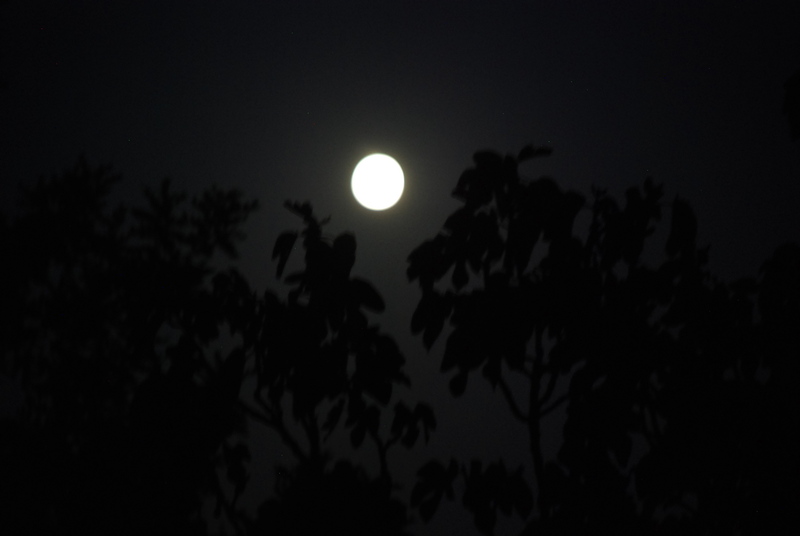 It is observable and only happens at full moon. They are fully alert, communicating with each other and paired off as mother and foal (although the foals are now adults): Matilde and Aitana pictured, Rubí and Morris just as close to each other and looking to the moon rising. I have never successfully managed to get good donkey and moon shots, although I have tried several times before. These shots are inadequate but I’ll keep trying! And here we are: the moon is above the fig tree. It is a special moment, as the fig tree is full of ripe figs and the donkeys are only allowed one fig each per day. The moon sanctifies the fig feast and I give the donkeys a fig each in the moonlight. There is no risk of getting my fingers bitten because now the moon is up and they are becoming invisibly calm. I can feel the calmness in the moonlight. And that is where we will leave the donkeys for now. On a full moon night I always go down to see them at midnight. They will be all sitting under the lemon tree looking at the moon. 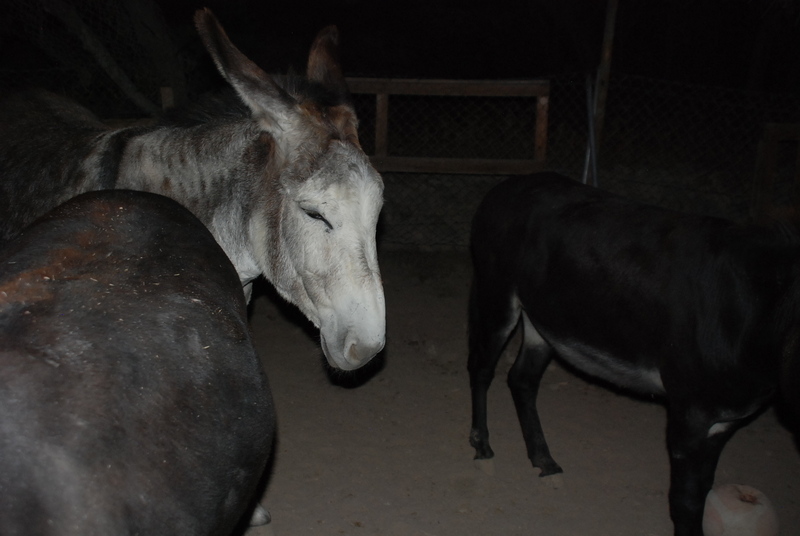 It is very difficult to photograph this, as the flash ruins the light and startles the donkeys, but a long exposure requires setting up a tripod and they all get up to examine it… so the shot is lost. What shall I do with 48 cans of tuna? Tomorrow the Vuelta á España comes along the coast, past Benidorm and up to the finish at Benitaxchell, and I’m going along with a few friends from Finestrat to see if Chris Froome and the Sky team can finally get a stage win. We will be taking a picnic lunch, so finally I can try to use a significant quantity of the tinned tuna in my cupboard. 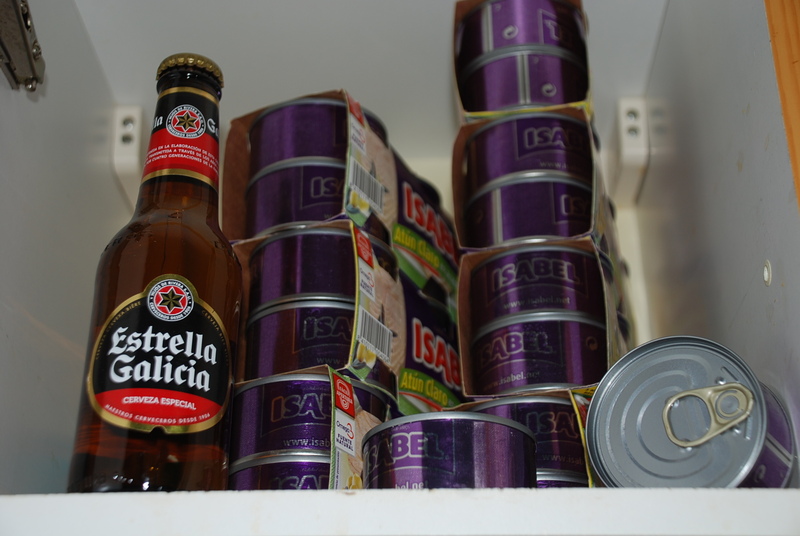 The problem began due to a misunderstanding over a promotion at Carrefour, where the packs of 24x Estrella Galicia beer seemed to be reduced from 12 Euros to 7.80 Euros, plus twelve tins of tuna with every pack. I decided this was too good to miss, and I sent a text to my drinking mate Carl who put in an order for a pack of Galicia beer with twelve cans of tuna. I bought four packs of Galicia for myself and walked away with 48 cans of tuna. All that took place a few weeks ago, and now I only have forty-five cans of tuna left. Tomorrow I am going to make a huge bring-and-share tuna salad. 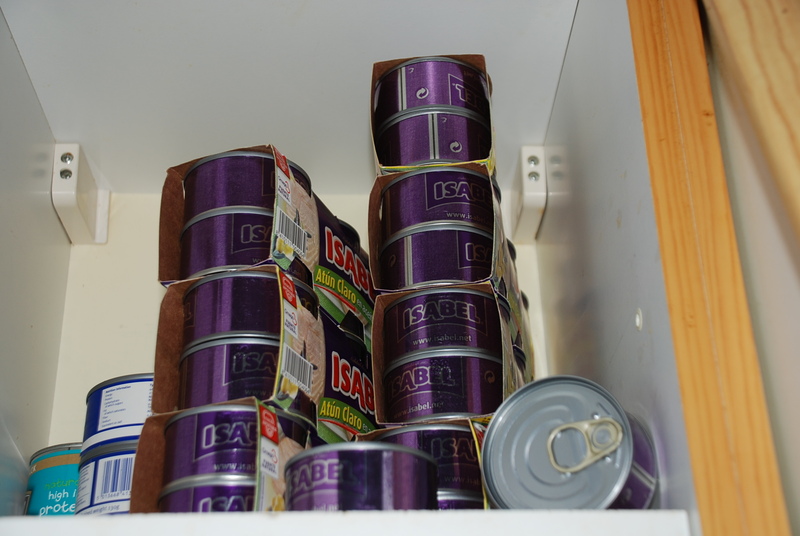 I have an odd suspicion that my friend Carl (with his twelve cans of tuna) may well be trying the same ploy. If Chris Froome wins tomorrow, we may have a very nourishing pile of tuna salad left over to help him build up his strength for the next day of the bike race. This is very predictable but have you ever thought of adopting some cats?